Built using funds willed to the City by Mrs Elsie Perrin Williams, London's Central Library building was named as a memorial to this generous citizen of London. The building was opened on 4 October 1940 by the Ontario Minister of Education at the time, Duncan McArthur?. It was the fourth library building for the City, replacing the previous Main Library at the comer of Wellington Street and Queens Avenue. In 1942 the American Library Association Bulletin hailed this new library building, writing, "...this clean-cut, inviting building, ..., is one of the finest examples of what a modern public library should took like." They went on to feature "The ingenious ground floor plan ... includes a spacious, well-lighted children's room with entrance across a large sunken garden and lawn.... The main floor plan ... is a definite and successful contribution to library architecture." The library was designed to meet an extensive list of educational needs. It incorporated an auditorium, an art gallery and featured a Children's library with a children's Club Room and an outdoor reading garden where "children may read in the fine weather while at the same time getting fresh air and sunshine. As the demands on the library changed, so has the building been adapted to suit those demands, but some of the original furniture is still in use in the London Room and the Central Hall retains the openness of the atrium even though the skylight was covered with a second floor addition. The original library building was designed by London architects Thornton McBride? and L. Gordon Bridgman in consultation with Richard Crouch, the Chief Librarian. The design reflects and symbolizes the Greek ideal of freedom gained through rational thought. This ideal countered the threats of war that were rampant in the world at the time that the design was struck. Also reflecting the themes of the time, the building's form is austerely classical in which beauty, dignity and simplicity are combined. Several of the original architectural features are still present and deserve preservation. The front and side walls are faced with Queenston limestone. Engraved across the front face are the words, "London Public Library ELSIE PERRIN WILLIAMS MEMORIAL Art Gallery and Museum" in between decorative horizontal bands above and below. The front door is surrounded by a tall projecting frame decorated with carved Greek key designs and a mask of Socrates over the door. The double doors are surmounted by a large, 3 by 5 light transom doubling the height of the doors. In front of this projecting frame is a large terrace, flanked by stone parapets decorated on the front faces with carved allegorical designs. The exterior window spandrels are made from black Virginia serpentine marble, separated by fluted stone pilasters. In the interior, the finish of the walls in the Foyer was described (in 1940) as "jaune ambre French marble" and most of it remains in place. The floor in the Foyer is the original patterned terrazzo. The original stairway leading up and down from the Foyer is still in use. Two of the original light fixtures still hang in the Foyer and Vestibule. The original wooden doors remain between the Foyer and the Central Hall, originally a central atrium covered by a huge rectangular skylight. Openings off the Central Hall are flanked by ribbed pilasters that reflect those of the facades outside. The clock over the front door remains today. 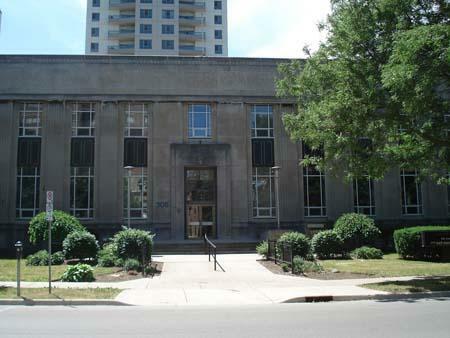 The architectural styling of this building and the use of Queenston limestone is quite uncommon in the City, but is reflected in the Dominion Public Building at 457 Richmond Street. The limestone also ties the building with the Bell Canada building at Clarence Street and Dufferin Avenue.